Robotic systems are increasingly being used as channel for collecting data allowing scientific have great understanding of the planet and its environmental processes. There are new emerging research trends for achieving large-scale environmental monitoring. A robot and wireless sensor network interaction such as temperature, sound, pressure, and to pass their data through the network to the main location. These trends offer efficient and precise measurement of environmental processes at unprecedented scales that will open the door of robotic in environmental industry. Robots are built to take on tasks which are heavy, difficult or even impossible for humans. Robotic systems include vision systems and a sensor that helps to perform a more complex operation. 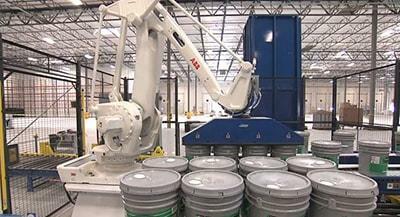 The demand for robots handle chemicals will increase because industry continues to increase the numbers of chemicals. The modern world economy, it converts raw materials (oil, natural gas, air, water, metals, and minerals) into products that contain chemicals. The robot handles the hazardous materials improving the vision systems and other sensory equipment. Whether you require an industrial control system to control pollution or robot systems to dismantle a nuclear plant, Phoenix Control can guide you on next step.